PDF to Word Converter for converting PDF files to Word documents. 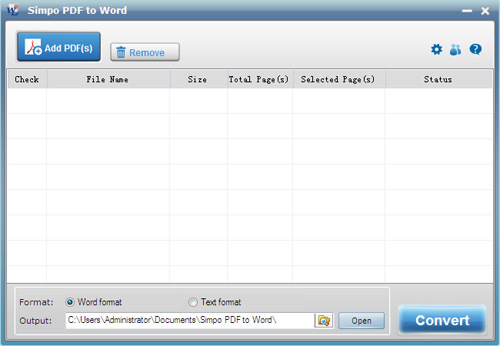 Simpo PDF to Word only takes seconds, and even faster, to convert a huge pdf file to .doc without any quality lost. What's more, Simpo PDF to Word supports batch conversion to save your time. Simpo PDF to Word is a standalone PDF to word converter, which means you needn't extra install Microsoft 'Office Word, Adobe' Acrobat or Reader to convert any PDF files. Qweas is providing links to Simpo PDF to Word 3.2.3 as a courtesy, and makes no representations regarding Simpo PDF to Word or any other applications or any information related thereto. Any questions, complaints or claims regarding this application Simpo PDF to Word 3.2.3 must be directed to the appropriate software vendor. You may click the publisher link of Simpo PDF to Word on the top of this page to get more details about the vendor.